Love casino games? Then head into the historic Grand Hotel. 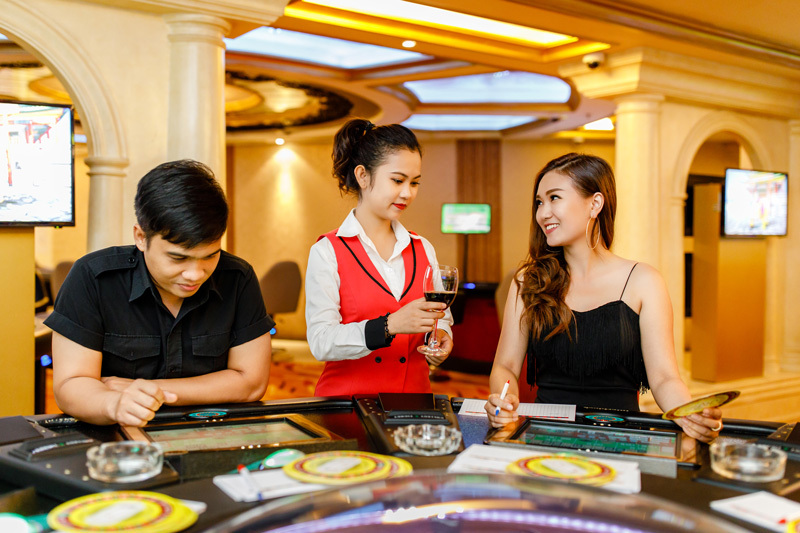 On the mezzanine level you’ll find the best place to gamble in downtown Saigon—Grand Club. High-energy and non-stop gambling action will keep the excitement rolling as you up your stakes for the big win. Grand Club is one of Saigon’s hottest casinos in town because it’s stocked with the coolest casino games around. From the classics, like Roulette, Baccarat and Blackjack to a huge selection of slot machines, the Grand Club is sure to have your game. 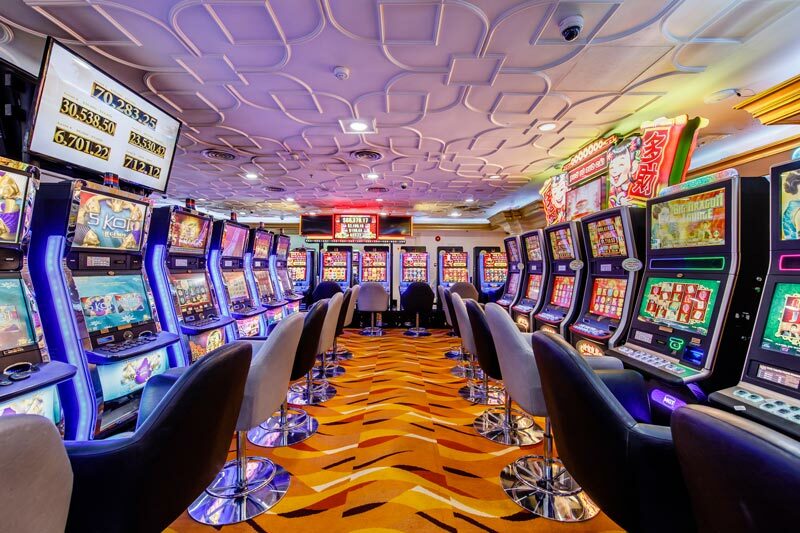 From the moment that guests enter the casino, the rhythmic sound of the slots chiming create a soundtrack that pulls the guest out of the calm of the hotel and instantly elevates the excitement. Grand Club features the top casino games in classic luxury. Sink into one of their buttery leather club chairs and within minutes a cocktail waitress will arrive with the free cocktail. An Old-Fashioned or a Mojito? It’s your game. It’s your choice. Your gambling experience will be one of comfort and class at the Grand Club. All guests are greeted with top service and smiles, so that you can spend your time focusing on your game. With 32 Roulette stations, five Blackjack stations, 10 Baccarat stations and 69 slot machines, there are 116 ways to win big. The casino takes pride in the fact that the game room can accommodate any type of player. Some guests come in looking for the nostalgia of old time slot machines or table games. Others are seeking fully-automated and state-of-the-art equipment. Regardless of whether your casino game of choice is about chasing the thrill of hitting 21 in a game of Blackjack or watching the symbols slide into place at the slots, Lady Luck is on your side. 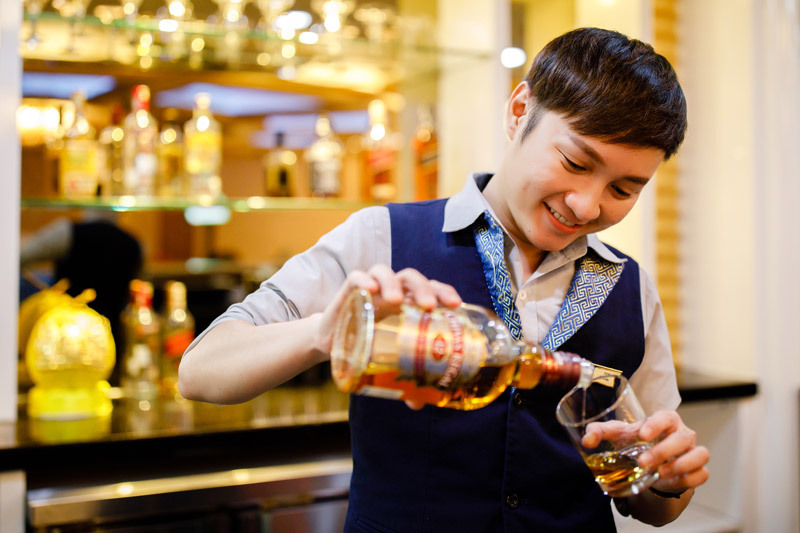 At the Grand Club in Saigon, there is gambling fun for everyone. One of the sweetest perks of playing at Grand Club casino is the membership program and its benefits. Loyal players can gain points as they play and participate in a lucky draw each week as well. When enough points accumulate, players can redeem them for complimentary rooms at the Grand Hotel, spa services at Le Grand Spa, dining in Parisian style at Chez Nous restaurant, play vouchers and more. Members can use their points to spend their day indulging in the steam room, jacuzzi and a deep tissue massage at Le Grand Spa and then finish off their evening gambling in style at the Grand Club. Grand Club opens is open 24-hours a day to accommodate serious players as well as anyone who has the urge to gamble at any time of night or day. Grand Club is the perfect place to come to ease the tension of a long work day with friends or to gather your colleagues for a bit of team-building. The festive space is also ideal for events such as birthdays or bachelor parties. Whether you come in a group or solo, as a long-time member or a first-time player, the Grand Club will make you feel like an honoured casino guest. Grand Club is open to the public as well as guests of the hotel. Residents of Ho Chi Minh City can make the Grand Club their go to place for a night of lively gambling, excellent cocktails and fast-paced gambling fun in Saigon. Did Someone Say Mystery Jackpot at Grand Club? Want to know the best way to win big at Grand Club? Play big. Lots of casinos tempt you to place your bet by offering a jackpot, but it is only at Grand Club casino that you can have an hourly chance to win! The more money players put down the more chances there are to win. 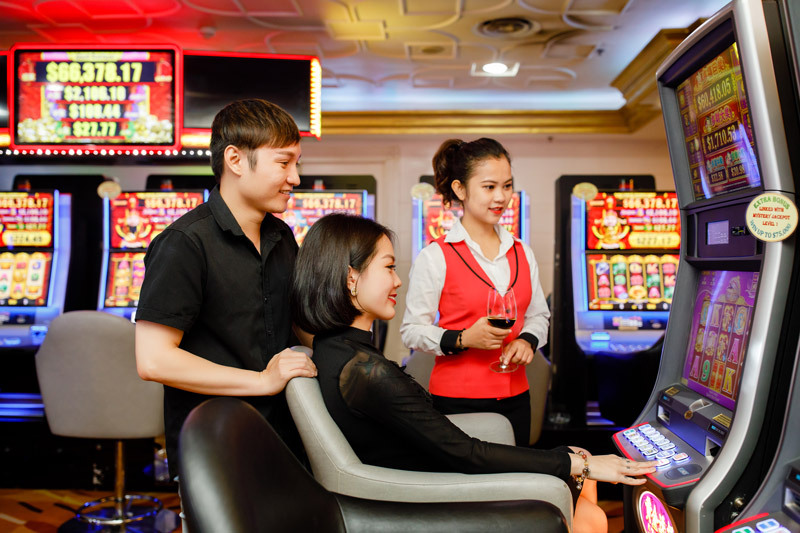 Grand Club’s slot machines are connected with a progressive mystery jackpot system, which means if there are eight players betting on the slots, all of that money is accumulating to make someone a big winner. Don’t let the moment pass you by at Saigon’s best casino! Pop into the Grand Club early for a coffee on the house and a shot at a win, then head out on the town for some sight-seeing and shopping. Grand Club is centrally located in Ho Chi Minh City’s downtown District 1 on the most famous shopping boulevard in town—Dong Khoi street. International restaurants, Asian artefacts, the historic Opera House or rooftop cocktails… you can find everything you dream of within walking distance of the Grand Club casino. Afterwards, guests can cool down their weary from walking feet in the crystal blue waters of the Grand Hotel’s swimming pool or treat themselves to a luxury massage before heading back to the Grand Club to raise their adrenaline while playing the best casino games in Saigon. At this Saigon hot spot, the latest technology makes your favourite casino games modern. Grand Club is an e-gaming club, which means there are no live dealers or cards. Instead, players follow the game at their automated play terminal. No pause in play means there are more chances to enjoy the exhilaration of a win. The classic table games you would find in Las Vegas or Macau like Roulette, Blackjack and Baccarat take on a modern twist in the luxurious surroundings of the Grand Club. Grand Club takes care of your every need, from complimentary cocktails and free food for players to big screen TVs showing the latest sports games. This is the place to go to enjoy safe and 100 percent legal gambling at your favourite e-gaming center in Saigon. Grand Club is one of the most trusted places to play casino games in Saigon. Place your bet on the best casino table games or try for the Mystery Jackpot at the slots machines to enjoy the thrill of the play anytime. Play the games you love and reap the rewards that keep on giving. Head over to the Grand Club casino in Saigon and start collecting your player’s points now.